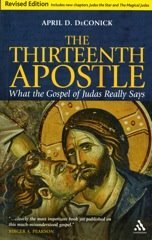 On 6-3-08, I started a series of apocryphotes that were related to saying 22 in the Gospel of Thomas. I have been trying to post a new one each day (minus the weekends). I finished yesterday. What have we learned? That versions of this saying were very popular, going back to our oldest extant source - the letters of Paul. It was well-known probably because it was part of the early baptismal liturgy in Antioch and probably also in Jerusalem. Most of the sources where we find versions of it preserved are from Syria, and even more, eastern Syria. Hermeneutically it was connected to Genesis 1-5, and rectifying the separation of the androgynous man into male and female beings. Either celibacy (Syrian encratites) or marriage (Valentinian Gnostics) were thought to restore, in practical terms, the primal androgynous man. Hermeneutically this saying also became intertwined with bits of other Jesus sayings, particularly those in which he spoke of the coming together of opposites like the inside and the outside, the right and the left, and the above and the below. All of these bits meant to explain how the primal human could be restored. So we also see bits about a new man or a new creature being formed, eyes in place of eyes, hand in place of hand, and foot in place of foot. The image of little children amalgamates because the person is being rebirthed and is again a child in the Garden. These sayings, along with their early hermetic equivalents, become very important for the later Hermetic and Alchemical movements which were all about the birthing or transformation of materials into some perfected or divine substance. How difficult it becomes to speak of intertextuality and literary dependence. The model I prefer is that of intertraditions, where these ideas and practices are a well-known part of the Christian landscape, and they erupt in the literature not because one person is copying from another person, but because our authors are part of this common landscape. The sayings of Jesus remain important jumping off points hermeneutically. But not any hermeneutic was permitted. The hermeneutic had to make sense to the already existing landscape, and what was already known to be true about that particular saying. Bits and pieces of other saying were intertwined from memory, as the person worked to explain and teach within this landscape. So what was in the prophet's mind when he said: "What God has joined together, let man not separate", Mk.10:9? God can't make two bodies join together surely, can he? This is a clear recognition that there was a possibility in the mind of the writer that a person's spirit could have existed before his body and have an eternal independent existence. Such an idea leads me to suggest that in Mark 10.9, the prophet had in mind God joining together a male spirit with a female spirit. For my money, the FIRST creation story of Genesis was originally about the creation of a completely spirit world that would bring the second creation of the physical world to life. Thus, the first creation story was subsequently garbled (probably by the priests) to conceal its original meaning. In what looks like remanent information for example, the earth was 'without form'. As you ponder this symbolism of the "two and the one" it might be of some help to read C.G. Jung's cryptic little book Septum Sermones ad Mortuos. He attributed it to Basilides through a sort of chanelling experience. Be that as it may, it does shed some light on Jung’s thinking on this matter. I think that Dr. DeConick is on the right track here in her investigation. I agree that it is not necessarily a question of intertextuality and literary dependence but not even necessarily of "intertraditions." The “common landscape” is actually the common, that is, the collective psyche that allows humans to independently ponder this question of the reconciliation of the opposites and come to more or less similar conclusions or interpretations. We find this question arising throughout the world without necessarily any inter-cultural contact. What is it that is being pondered when we speak of an original androgynous state that is then separated into “male” and “female” only to be reunited later through some process that one should not again rend asunder? Is the last state a return to the primal state or an entirely different condition? Mark 10.6 has: "But at the beginning of creation God made them male and female." Saying simply God created males and females in the beginning would have been nonsense to the prophet's antagonists who were probably priests concerned about divorce. It would have been quite apparent to them that God had created men and women - after all they were asking a question about divorce of a man from a woman. So the prophet was saying that the contemporary men and women his antagonists were concerned about, God actually created in the beginning, that is, he created their spirits in the beginning of creation, i.e. the spirits of all people were created in the beginning of creation. And the God created female spirits in contemporary women and the male spirits in contemporary men were were what animated them to be drawn togther to become in effect one spirit in a marriage. It was a male spirit joined to a female spirit that became one (Mark 10.8). Many 'Essene' marrieds lived together without physical union, at least for a time. To my thinking the Essenes were none other than the prophets. And such Essenes would have regarded a true marriage made by God would have been between two cleansed spirits. Thus the prophet could say that Moses had permitted divorce, not "because your hearts were hard" (10.5) which was no doubt an editor's rendering of "because your spirits were impure". And finally, I suggest 1 Cor. 15 was originally not about resurrection of the body, but was about the instantaneouis rising to glory of purified spirits from bodies at death. The chapter leads on to the nonsense of God planting "a seed perhaps of wheat or of something else", and giving "it" a body 1 Cor.15:37,38. I suggest that the original prophetic writer was saying that God planted a spirit in a body perhaps of truth (not the "wheat" nonsense) or deceit (the "something else" nonsense). In other words we have the two spirits of the DSS. So 15.38 would have read: "God gives the body (not "it") a spirit (not a "body") as he has determined. The point was that God did not plant the spirit that "will be" (15.37), i.e. the the spirit that will rise to glory will be purified. (15.36) The Pauline editor has changed the text from one originally about rising of spirits to one about resurrection of the body in agreement with his Christology. The different kinds of bodies were originally different kinds of animating spirits, including for example, the spirits that moved the heavenly bodies such as the moon and the stars - thus "there are heavenly spirits and earthly spirits". (15.40).